Autumn is truly here and Christmas is just around the corner. I am getting busier and busier preparing for the festive holiday. Luckily I have an amazing team mixed with reindeers, elves, huskies and my wife, Mrs. Claus, that support me along the way. This year I have decided to introduce you to some of the key members of my team that will help me to deliver important festive messages to you online. Not only do they help me with my busy schedule, but they will also be able to help you with all the different queries you may have along the way. So ladies and gentlemen, boys and girls – I present to you some of my amazing jolly staff members! Nokkela (or Nokki as we call her) is a fabulous young Elf. Nokki is my clever Elf assistant and she has many talents. She is really good at maths and helps me balance my books! Nokki is a talented storyteller and delights in telling everyone about my daily adventures and experiences. Nokkela actually means clever in Finnish so her name certainly suits her. Hannes is my fantastic husky dog! He is a very active dog and he loves anything sporty and outdoorsy, and oh boy is he good at it. He’s in charge of all the fantastic excursions we have here in Saariselkä. He loves talking about adventures and sports, and is never shy to give some expert advice when it comes to things he’s passionate about. Mrs Claus is my amazing wife and best friend. She makes sure the whole team is properly fed and looked after; something that is vital when working as hard as us. Not only is she a fantastic cook, she amazes us every time with her fabulous baking! She loves passing on all her secrets and great skills such as cooking, baking and making Christmas decorations. Rudolf and his red nose may not need a huge introduction, as I believe most of you know who he is. 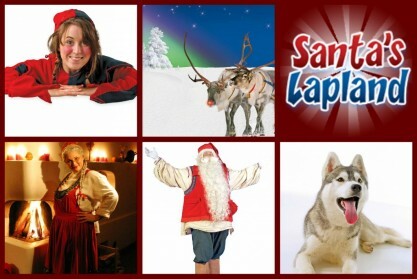 Because he is so playful, he is in charge of all the games, parties and fun events that we do here in Saariselkä. He loves sharing my secrets with all of the guests and will always get involved with the fabulous Christmas parties and games. Want to know more? Nokki, Hannes, Mrs Claus, Rudolf and I will be sharing all our secrets and enthusiasm with you right here, in the blog! So keep checking in for the latest updates from the team! Would you like to come and visit me and my team in Saariselkä? Call us now on 01483 791 945 or book online right here.